This website, the Altoona Railway Museum Club, is an unofficial site for the Horseshoe Curve Chapter, NRHS. It is no longer affiliated with the Horseshoe Curve Chapter, NRHS. President Francis X. Givler, Jr.
You are also welcome to attend a Horseshoe Curve Chapter, NRHS, meeting or email the Chapter. These pages were last updated on: September 21, 2018! 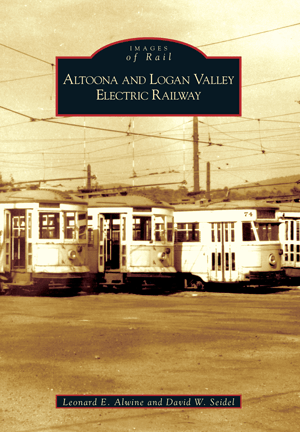 12-11-2005: Chapter members Leonard E.Alwine & David Seidel have co-authored a pictorial history of Altoona's other railway, the 'Altoona & Logan Valley Electric Railway', which operated on the streets of Blair County from 1888 to 1954. 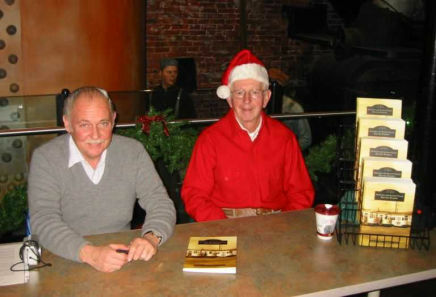 David and Leonard are pictured at the book signing event at the Railroaders Memorial Museum. Dating back to 1882, the Altoona and Logan Valley Electric Railway has humble origins, but it quickly became a viable transportation system serving the city of Altoona. Often referred to as the Logan Valley, the railway employed 300 people, transported 11.5 million passengers a year, and traveled 7,220 scheduled route miles a day until economic conditions forced the line to discontinue service on June 2, 1954. Altoona and Logan Valley Electric Railway documents the history of a streetcar network that served the employees of the Pennsylvania Railroad as well as the community. Through 200 images and informed narrative, this book retraces the history of the Altoona and Logan Valley Electric Railway and its successor, the Logan Valley Bus Company. The book contains approximately 200 photos of the Altoona & Logan Valley, covering its entire history, including a chapter on the Logan Valley Bus Company. The trolley operations ended in 1954 and the bus company ended in October 1959, resulting in the creation of Pennsylvania's first public transit authority which we know today as Amtran (publicly owned/controlled as opposed to a private entity). Copies of the book retail at many Altoona area bookstores and can also be ordered from the publisher at http://www.arcadiapublishing.com/index.html. Leonard E. Alwine is a member of the Horseshoe Curve Chapter of the National Railway Historical Society, the Railways to Yesterday and Rockhill Trolley Museum, and the Lakemont Park Historical Museum. He has written numerous works on railroad and firefighting history. David W. Seidel is a founding member of Horseshoe Curve Chapter, National Railway Historical Society, and he serves as its chapter historian. He is also a founding member of the Railroader’s Memorial Museum and its predecessor, the Altoona Railway Museum Club. The Pennsylvania Railroad was incorporated in 1846 and immediately began the task of finding an all-rail route to connect Philadelphia with Pittsburgh. The Pennsylvania Railroad surveyed possible routes and arrived on a valley floor at the base of the Allegheny Mountains in 1849 that was primarily occupied by the David Robeson farm. As people arrived for employment opportunities, the railroad company purchased the Robeson farm, laid out the plan of a town, and named it Altoona. Shops were established, and crafts were needed as locomotive and car design and building evolved, all with increasing population and prosperity. 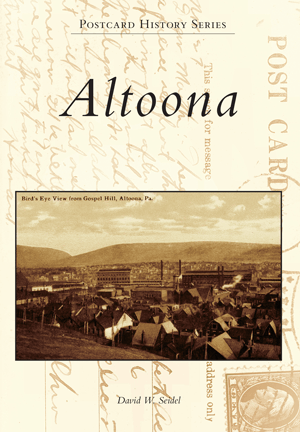 Altoona grew from farmland to 75,000 people in 75 years. Note: Proceeds from the sale of the book will benefit the Blair County Historical Society, Altoona, PA. Copies of the book retail at many Altoona area bookstores and can also be ordered from the publisher at http://www.arcadiapublishing.com/index.html . Author Bio: David W. Seidel is a founding member of Railroaders Memorial Museum, a founding officer and chapter historian of the Horseshoe Curve Chapter of the National Railway Historical Society, and a member of the Blair County Historical Society, the Blair County Genealogical Society, and the Altoona-Blair County Photographic Society. He is the co-author of Altoona and Logan Valley Electric Railway with Leonard E. Alwine and author of Horseshoe Curve. The Horseshoe Curve is known worldwide as an engineering achievement by the Pennsylvania Railroad. This landmark, located just west of Altoona, opened to traffic on February 15, 1854, and it enabled a railroad line to climb the Allegheny Mountains and the eastern continental divide. The Horseshoe Curve’s construction impacted railroad design and development for mountainous terrain everywhere, enabling access to coal and other raw materials essential for the industrial age. J. Edgar Thomson, chief engineer of the Pennsylvania Railroad, is widely recognized for his engineering and design of the Horseshoe Curve, a concept never utilized previously. Today the curve is still in use and sees approximately 70 trains daily. 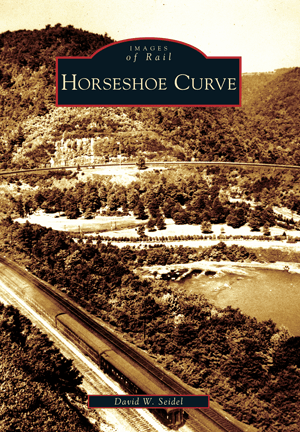 Through vintage photographs, Horseshoe Curve chronicles how this marvel remains one of the vital transportation arteries linking the east and west coasts of the United States. Note: Proceeds from the sale of the book will benefit the Loretto restoration project at the Railroader's Memorial Museum, Altoona, PA. Author Bio: David W. Seidel is a founding member of Horseshoe Curve Chapter, National Railway Historical Society, and he serves as its chapter historian. He is also a founding member of the Railroader’s Memorial Museum and its predecessor, the Altoona Railway Museum Club.